CTUF’s Australian Correspondent Barry Camfield sent us this from Australian Congress of Trade Union’s Secretary Sally McManus. “I’m just back from the Fair Work Commission, where they decide whether 2.3 million Australians will get a pay rise, and if so, how much. On 1st July 2018 the minimum wage will increase by 3.5 per cent (or $24.30 per week) to $719.20 for full-time work. The new hourly rate will be $18.93. All award wages will also increase by 3.5 per cent. This is the biggest percentage increase the Fair Work Commission has awarded and it has only happened because union members fought hard for it. It means 2.3 million workers will get a pay rise next month. But working people need more – we need a living wage. The minimum wage should be pegged at 60% of the median wage. This is the international poverty line benchmark. Even with today’s increase we are still below that mark. Working full-time should be enough keep you out of poverty. We need a living wage in Australia to make sure that’s what happens. It is union members who fight for and win wage rises. 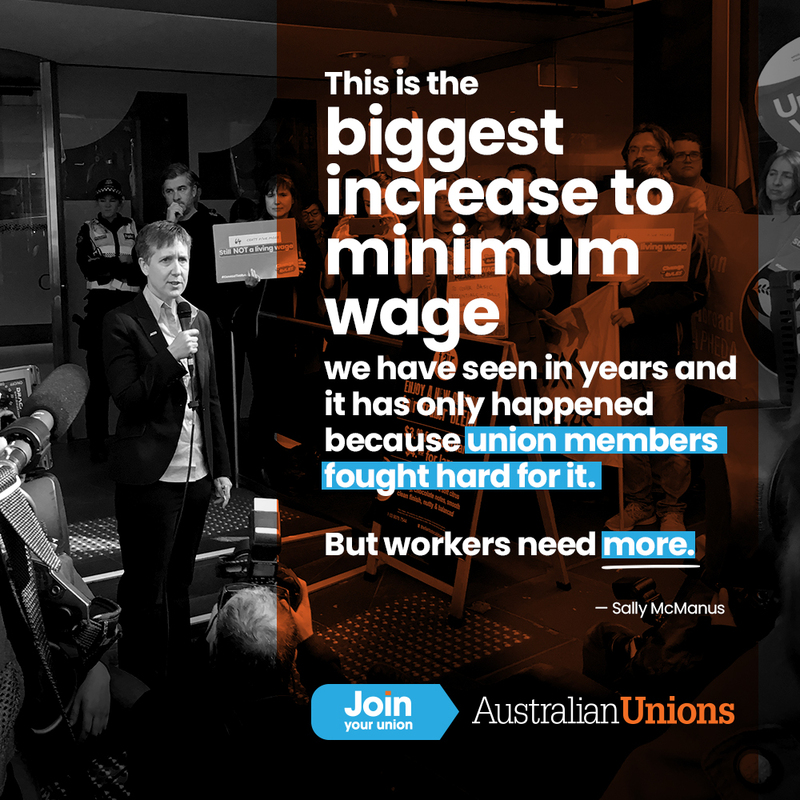 We are changing the rules in Australia so that all working people can have better pay. Join the movement for change and help make our movement stronger.